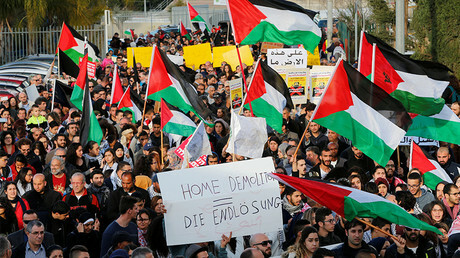 Jews and Arabs marched together in Tel Aviv to protest the planned demolition of homes in the Arab village of Kalansua and a Bedouin village of Umm al-Hiran. An estimated 5,000 protestors marched late Saturday, waving both Israeli and Palestinian flags. 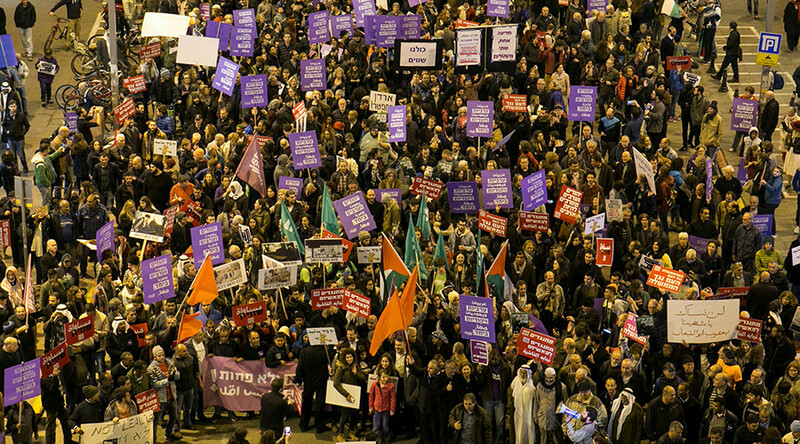 They were led by opposition politicians from the left-wing Meretz Party and the largely-Arab Joint List coalition. The protestors accuse the government of stepping up demolitions of Arab homes built without permits to appease conservative Israelis angry about the demolition of the controversial Amona settlement on the West Bank. "The law must be equitable. The same law which obliges vacating Amona also obliges removing illegal construction in other parts of our country," Prime Minister Benjamin Netanyahu said in a video address in December, as quoted by AFP. "Therefore, I have given orders to speed up demolition of illegal construction... in all parts of the country and we shall do that in the coming days." The Amona outpost was cleared out Thursday in spite of violent resistance from protesters, and the buildings on the site are due to be demolished shortly. However, while Amona was deemed illegal even by Israeli courts, the government routinely approves the construction of settlements on occupied territories in East Jerusalem and the West Bank. By contrast, the authorities relatively rarely grant permits for the building of Arab homes. Umm al-Hiran, the unrecognized Bedouin village in southern Israel which is due to be demolished, was the site of an alleged terrorist attack in January in which two people lost their lives. The police claim a local man, Yakub Abu al-Kiyan, ran over and killed an Israeli policeman, Sgt. Maj. Erez Levi, before being shot dead himself, and that the 50-year-old had pledged allegiance to Islamic State (IS, formerly ISIS/ISIL). Villagers deny the allegations and say he was a respectable teacher. An initial autopsy showed al-Kiyan may have lost control of his vehicle after getting shot in the knee, causing him to slam into Levi, but further investigations have proved inconclusive. Amal Abu Sa'ad, the widow of Yakub Abu al-Kiyan, addressed the crowd on Saturday. Arabs make up around one-fifth of Israel’s population and routinely complain about discrimination and being denied the same settlement rights as Jews. The Israeli settlements in the West Bank and other occupied areas are among the most contentious issues in Arab-Israeli relations. Despite the UN and international community considering them illegal under existing agreements, Israel continues to expand its settlements in the territory, something which both the Palestinians and outside powers, including the United States, see as an obstacle to the peace process.